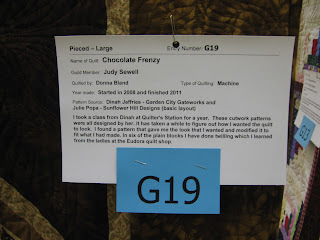 Asthma aside, my guild's quilt show was even better than last year's. There were over 100 quilts displayed. IT Prof served as my photographer-in-chief on Saturday. 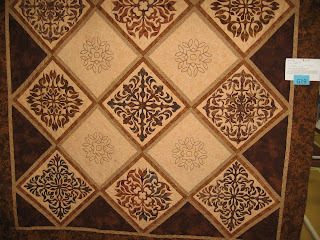 This was especially kind since it is so difficult with just an ordinary camera to photograph queen-sized quilts in the small space available at the show. Most of the time IT Prof managed to capture the three-dimensional effects of quilting anyway. I hope you enjoy my new continuing series of photos from the show. One of the nicest people I've ever met made the quilt shown above. This is the breathtaking quilt which stopped me in my tracks on Thursday and every subsequent time I saw it. Was I happy when Judy Sewell's Chocolate Frenzy won the ribbons for Best Large Pieced Quilt, Best Machine-Quilted Quilt, and Best in Show! The appliqued cutwork makes my fingers ache just to look at. Judy's applique was amazing because I couldn't see the stitches at all. In fact, the applique and its background looked as though it was one piece of fabric. The embroidered blocks are actually twilling; it is almost impossible to distinguish between those blocks. The workmanship (workwomanship?) on this quilt is outstanding. Most of the fabrics are batiks. Judy showed wonderful color sense in combining so many different browns harmoniously. Judy modestly told me that this was her "quilt of a lifetime." Anyone would be proud is she/he could refer to this quilt as that. I can only dream of creating a quilt as perfect and beautiful as this one is. 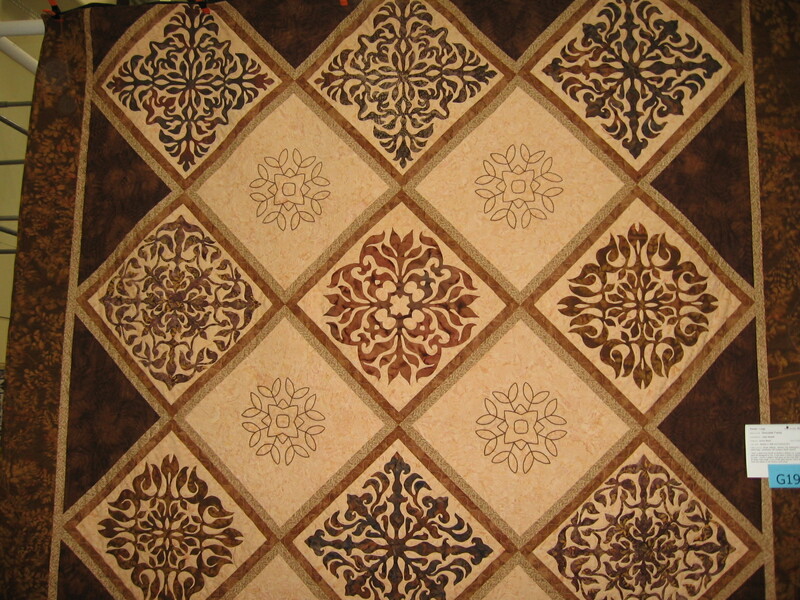 Donna Bland's machine quilting is incredibly intricate. She more than deserved her ribbon, too. Judy's quilt merits treasuring by generations to come.